Creeping Speedwell is an exceptionally ground cover that forms a tight mat of light green leaves topped that is covered with white flowers in mid spring. When in bloom, it will attract butterflies and hummingbirds. It is a very low growing ground cover that will only reach heights of 1/8" to 1/4" tall and will spread from 6" to 10" per year. Plant Creeping Speedwell in full sun or partial sun in well drained soil. Plant Creeping Speedwell in a Rock Garden, Miniature Garden, Moon Garden, in between flagstones or along pathways, massed over a large or small area as a ground cover, or in containers. 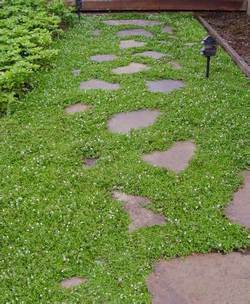 You can even use this ground cover as a lawn substitute as it will tolerate light to moderate foot traffic. It is deer resistant and is drought tolerant once it is established.